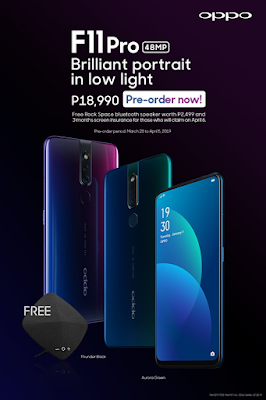 April 4, 2019, Manila, Philippines - OPPO Philippines has recently launched the arrival of its new F-series addition, the new OPPO F11 Pro at an irresistible great price of P18,990, with brilliant photography experience from the front rising camera to the stunning 48MP rear camera that allows users to capture ultra clear low-light portraits. Be among the very first ones in the country to get a hold of the latest OPPO F11 Pro. Pre-orders are ongoing until April 5. Customers can place their orders at all OPPO stores and authorized dealers nationwide. Customers who place their orders on or before April 5 will receive a free rock space MUSE Bluetooth speaker which is worth P2,499 It will be available for claiming at all OPPO stores and authorized dealers nationwide starting April 6, and it comes with a free screen warranty if claimed within the day. 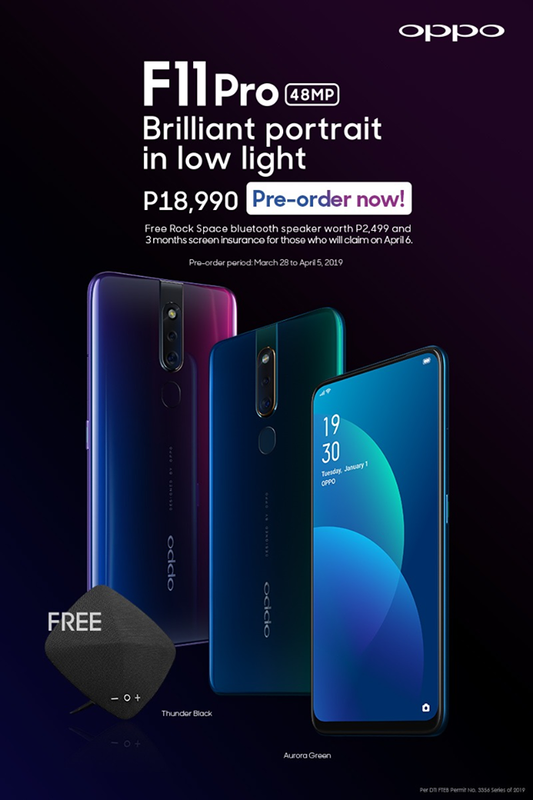 OPPO is making it even more accessible through Home Credit, where customers can pre-order the F11 Pro at 0% interest, with 9 months and 12 months to pay. Customers can also avail the product with no cash-out, at 0% interest and 12 months to pay with BDO and Metrobank as well. The new revolutionary low-power MediaTek Helio P70 helps in providing incredible capability through its camera accelerators that produce the crisp, clear, low noise images through 3X boost in depth-mapping performance, while also operating with exceptional efficiency to preserve battery-life. Tapping the P70's powerful AI processing unit (APU), OPPO has developed its AI-Ultra clear engine that powers its Ultra Night Mode. With regards to gaming, OPPO has independently developed its own performance acceleration engine called Hyper Boost, optimized for popular mobile games. By optimizing the system resource mobilization plan, hardware resources can be utilized more effectively, resulting in faster game response, no disconnections, and no dropped frames. Meanwhile, OPPO has introduced two useful tools — Game Space and Game Assistant, providing gamers with a more immersive gaming experience.